Safety shoes are a vital piece of PPE, offering the last line of defence against the crushing weight of heavy objects, or the hazards of dangerous chemicals. Are your workers’ shoes still protecting them? There’s an age-old adage that goes: “If the shoes fits, wear it.“ However, there’s a lesser-known proverb that says, “If a work shoe’s steel toe, steel shank or metatarsal guard is showing, it must be retired immediately.” Surprisingly, this one hasn’t gained quite as much traction in the mainstream. There is a good reason that inspecting and cleaning safety shoes isn’t always a high priority for many workers. The big reason is human nature. Simply put, people want to get where you’re going after work whether its home or your favourite restaurant, people have other things on your mind other than cleaning off their boots. The purpose of this article simply is to raise awareness of two important safety issues: knowing when people should replace their safety footwear and knowing the best ways to care for safety footwear in order to extend its life as long as possible. Choosing the appropriate shoe for the specific demands of the job is essential to ensuring that a safety shoe provides the proper protection. Since foot size and shape can change over time, each time you go to buy shoes find an experienced shoe fitter to measure you. Have your feet measured while you are standing. Try shoes on both feet. Many people have one foot larger than the other, buy shoes to fit the bigger foot. Remember, new shoes should be comfortable right away, a ’break in’ period should not be necessary. Footwear should be long enough, wide enough and deep enough to wear without rubbing or constricting any part of your feet. Sturdy, cushioned shoes with leather or canvas uppers are recommended. They should be comfortable enough to let the toes wiggle, but not loose enough to cause the foot to slide and rub along the sides. Recognise the signs of ill-fitting shoes. For example, corns and calluses are caused by friction from skin rubbing against bony areas of the feet, usually caused by shoes that don’t fit properly. Selecting the correct shoe for the job, however, is only half the battle. The other half is monitoring safety footwear for signs that the shoe may need to be “retired”. Further to this, there is no one-sizefits- all formula for knowing exactly when it’s time to replace safety shoes, as there are many variables to consider such as the job hazards, how often the boot is worn and the size and weight of the worker. Even within one organisation you will have people wearing safety footwear in very different settings. For example, a person working in the casting area of an aluminium plant will need to change his footwear every six months, but someone working in the warehouse might only need to replace their footwear every 15 months. 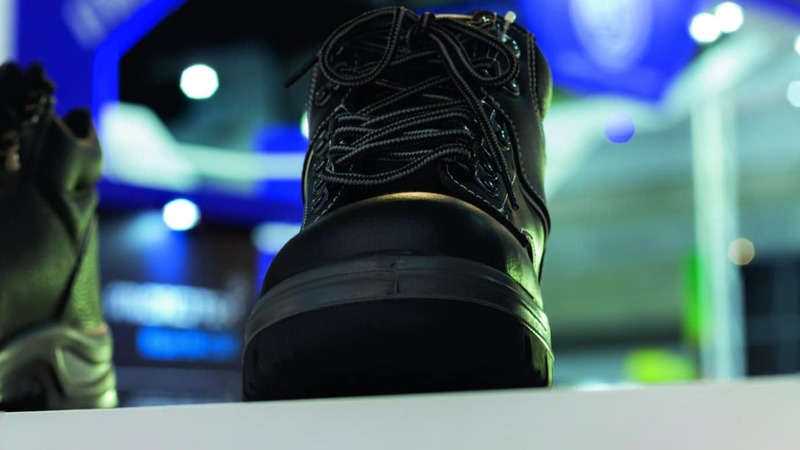 When inspecting safety footwear to see if it needs to be replaced, shoes with steel toecaps will offer more tactile clues than shoes with composite material toecaps. For example, if a heavy object falls on a steel toe shoe, the steel cap will be dented and will not “spring back,” indicating that the shoe must be replaced. Composite material shoes, on the other hand, could be irrevocably damaged in the same incident and still maintain their form. That’s one reason why it is often recommended to replace impactresistant safety footwear anytime something heavy is dropped on it. Even if there’s only “mild impact,” if there’s any doubt that the shoe will be able to offer protection next time something falls on it, this is the safest way to proceed. In many organisations the standard operating procedure is for them to reimburse its workers for 50 percent of the purchase of up to four pairs of work shoes a year, and they will foot the entire bill for a new pair of shoes in the rare instance that a heavy object perhaps drops on a worker’s shoe. This is, of course, a case of an obvious incident which has immediate and visible damage to the structure of the footwear. However, mild impacts are often ignored. These may well, over time and with frequency, also have a similar impact to the integrity to the level of protection. The ideal would be, after such an impact, that an inspection of the footwear be carried out. Not necessarily to high level but at least to determine that integrity is maintained. But I would be relatively confident in stating that this is a rare action to be completed, especially in high pressure industries such as construction. In some industries of course, the frequency of high impacts to footwear will be a lot less. Construction versus, say, warehouse management for example. In the latter the reason for replacement will be wear and tear, rather than catastrophic failure. The National Safety Council of the USA, in its “Selection and User Guide for Protective Footwear,” recommends immediately replacing impact- and compression-resistant shoes if there’s “evidence of physical damage” to the toe area or the shoe. For shoes with metatarsal guards, shoes should be replaced after an impact has occurred or when the metatarsal guard is exposed from wear and tear, according to the guide. For waterproof or chemical-resistant footwear made with rubber or PVC materials, it is recommended that boots be replaced immediately if there is any separation of the rubber or PVC parts, including the outsole, foxing (the piece of material that protects the joint between the outsole and the upper) or toe cover. One could say that it is common sense that once shoes are tattered and worn, the toes are poking through the sides, the steel toe is visible through the leather, then it tells you it’s time to get a new pair of shoes. However, footwear in this state is often seen, especially on construction sites. The same could be said for evaluating the tread on a slip-resistant safety shoe. Once tread or outsole shows signs of damage or wear, the shoe likely is reaching retirement age. If an area of the shoe’s tread is worn smooth or the tread design is not visible, then the need to replace the shoe becomes urgent, as the shoe isn’t providing the slip protection it was purchased for. Even though about 80 percent of the ‘slip-resistant magic’ in slip-resistant shoes is attributed to the compound found in the tread with the grid pattern itself only accounting for about 20 percent of the slip-resistant properties the tread’s design still presents an important visual clue for replacement. A good comparison would be to the tread on a car tyre. If the grid pattern is in place, the shoe will function. If the grid is completely eradicated, then it’s been compromised in some fashion. Also like tyres the grid patterns have been specifically designed, so any compromise to this design could affect the effectiveness of the slip resistance of the footwear. Something important to look for when evaluating the fitness of a rubber safety shoe or boot is the presence of cuts, cracks or punctures on the footwear, which could cause leaking. There are two ways to test a rubber shoe or boot for leaks, and neither is terribly scientific. They are detailed here. Remove the shoe’s insole and fill the shoe with water. Place the shoe on a newspaper and look for leaks. The disadvantage to this method is that once the test is complete, the boot needs time to dry before it can be worn again. Line the inside of the shoe with a paper towel or cloth. Place a heavy object on top of the towel or cloth to hold it in place. Fill a bucket with water so that the water level only is a few inches from the top of the shoe. (Do not let the water overflow into the opening at the top of the shoe.) Leave the shoe in the bucket overnight. The next day, take out the paper towel or cloth. If it is damp, there is a leak. A leak can undermine the ability of safety footwear to keep water or harmful chemicals from reaching the foot and replacement is, in general, the safest course of action. That’s also the view of the National Safety Council, which recommends discarding leather or rubber safety shoes when cracks or punctures appear. Experts say dedicating a few minutes each day to the care and maintenance of safety footwear can go a long way toward extending the life of workers’ shoes. While workers always should consult the manufacturer’s instructions first, experts offer the following tips for getting the optimal performance and life out of their safety shoes. If it’s feasible, purchase two pairs and rotate between the two pairs. On average, a worker can perspire as much as 200 millilitres of moisture into a boot or shoe when involved in heavy activity. Such moisture not only can eat away at the boot, but also can cause discomfort and blisters for the workers. By giving the footwear some time to dry it could extend the life of the shoe significantly. After each use, safety footwear should be sprayed off with a hose; dipped in water; or cleaned with soap, water and a cloth or brush, depending on the type of shoes and how dirty they are. (For full-grain leather, clean with a damp cloth or sponge and a mild detergent.) Cleaning footwear not only protects the shoe from deterioration but also makes it easier to detect signs of physical damage. Cleaning also helps performance, especially in the case of slip-resistant shoes. Using a brush or hose to clean mud and dirt from the bottom of slip-resistant shoes so they maintain their traction. If you wear safety footwear made with leather, it is advised to use shoe grease, oil or other moisturising cream available at shoe stores and other retailers to prevent drying out and cracking. As always, consult the manufacturer’s instructions first. If there are no instructions, visit the manufacturer’s website or a shoe retailer. If footwear doesn’t show physical signs of deterioration, a new sock liner can breathe new life into an old pair of boots. Often when safety shoes fail to meet expectations it’s because the shoes weren’t appropriate for the job task. Safety professionals can ensure that workers are outfitted with the right shoes or boots by conducting a hazard assessment for each job task to determine what kind of foot protection is needed for each job.